It’s the summer before high school and Chloe is being sent away. Her mother can’t cope and needs something that her daughter cannot provide. All Chloe wants is to get away from her grandparents and back to her mother, her friends, and the life she knows.That is until she falls in with a local gang of outsiders and begins to experience the world she has been missing. However, her mother’s influence is strong and, as her life increases in savagery and risk, the girl will be forced to decide how much danger she can stomach.Crocodile is a story about the powerful connection between parent and child, and the intensity of the final summer of childhood. As with his debut, Fallow, it is told in Shand’s trademark style, blending elements of the grotesque and tender, undercut by a current of dark comedy. 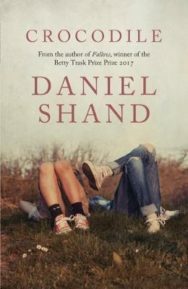 Daniel Shand was born in Kirkcaldy in 1989. He lives in Glasgow and works in Edinburgh, where he teaches at Napier University. His debut novel, Fallow, was published in 2016. It won the Betty Trask Prize and was shortlisted for the Saltire Society First Book of the Year.